Well were do we start? 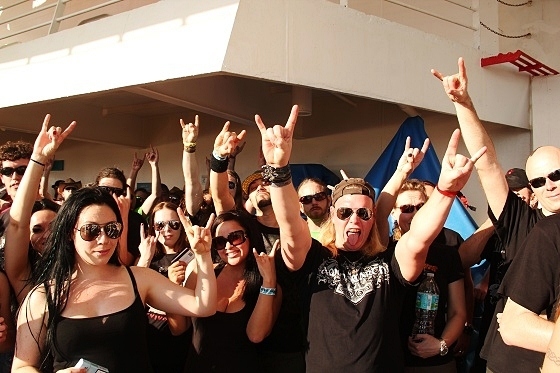 Trying to even describe what went down in Miami port, the Caribbean sea and Grand Turks at this year edition of 70000 Tons of Metal is by far the most difficult reportage we´ve ever done. Its almost harder than skydive without parachute and survive the impact. But we have survived three times now and this is the tale of the 3rd edition. 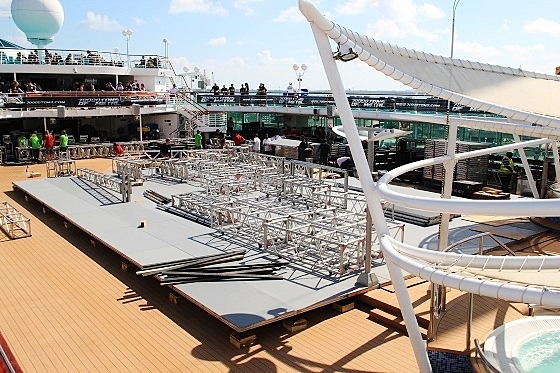 When a 73941 tonnage cruise vessel leaves Miami port with 2037 metalheads + 466 musicians and crew from 55 different nationalities you can be certain that its gonna be a hell of a voyage. 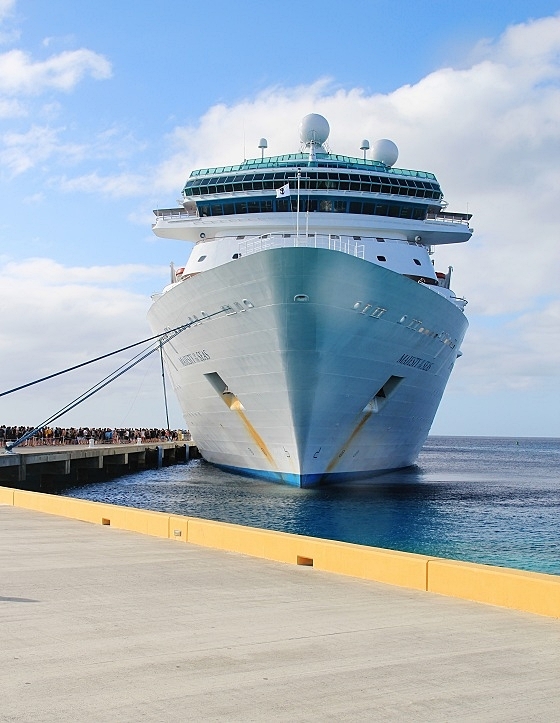 The 3rd cruise was more improved than ever before. 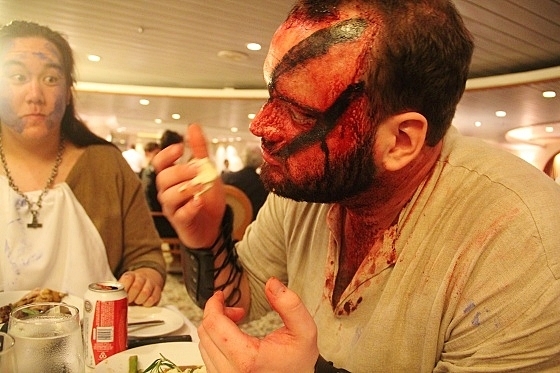 Headliners like In Flames, Kreator, Doro and Helloween together with Sabaton and a Metal Church reunion made this cruise experience a trip of a lifetime. Just as promised. The vessel leaves Miami port after 11 trucks of equipment is loaded unto the ship. Joyful screams and boisterous growls meet each other in a beer-drenched atmosphere under the 45 minutes the mandatory muster drill exceeds. 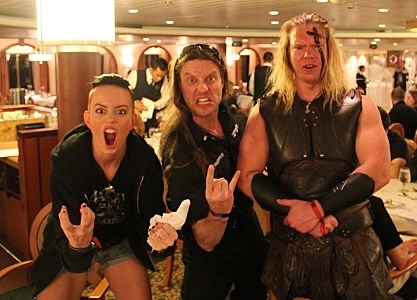 Helstar and Sabaton kick-starts the cruise like hell over Caribbean. We walked down with a bucket of beer to see the Swedish war machine perform at deck 5 The Chorus line theatre. 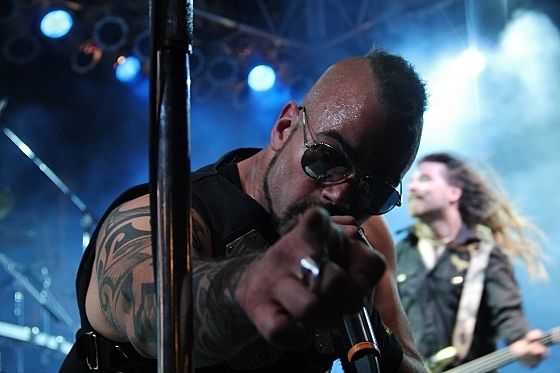 In ordinary manner Sabaton starts with “Ghost Division and” the crowd start to jump insanely, and sing-along starts directly as frontman Joakim Brodén takes the first tunes. Already at second song “Gott Mitt Uns” from their latest offspring Carolus Rex. 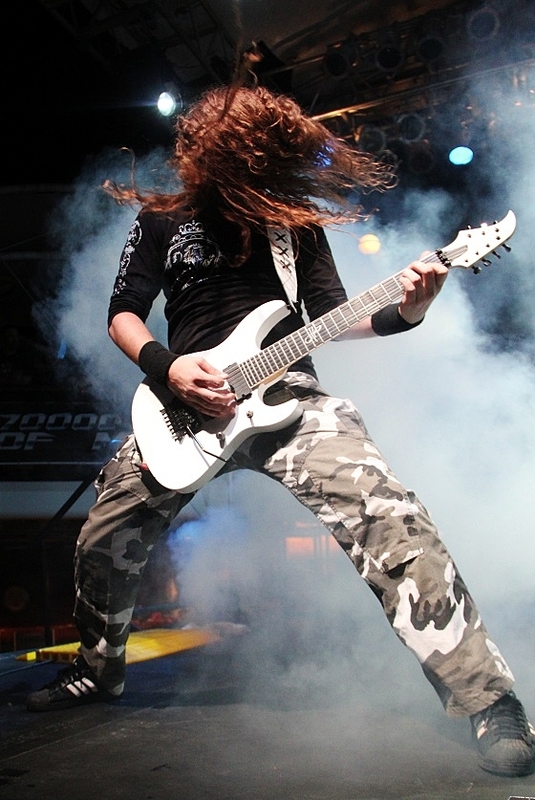 The crowd along chanting SA-BA-TON and Joakim breaks in and stops all the insane metalheads and asks. “Wouldn’t it be better from now on you cheer: band band band?”. And we just say “thank you boat”. We are on limited time here, then you continue to do that to all other bands aswell. That would really confuse them. 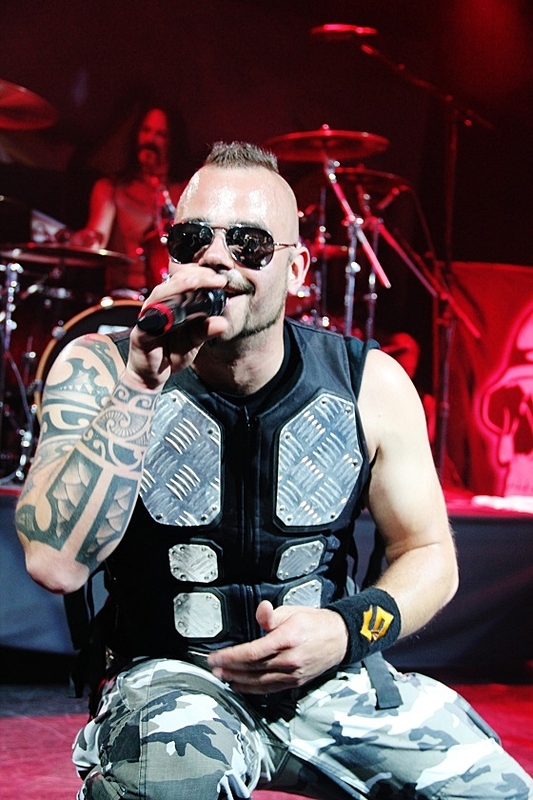 Sabaton is a great live band and funny to watch. Their energy on stage could power up a small city for the hour they are playing that’s for sure. A very good show and such a positive energy leaves no one asking for more. After the show we ended up at Schooner bar with the pool girls. A new invention to the cruise. Dressed by the famous Sharon Ehman (more known as Toxic Vision) They were brought aboard to help all pale Scandinavians with sunburn on pooldeck. After a couple of Pina-coladas and chatting with different band members and loads of beer. The boat were overwhelmed with real festival feeling. We went to see Helloween, at the same stage Sabaton played. We arrived late but so did the band. Apparently the German power metal band brought with them the most advanced drum rig they could find, everyone on stage looked confused and no one really knew what was going on. After 40 minutes delay Helloween was on stage with the starter: Are you metal? Sound was terrible we have to admit, Eagles fly free was way better but overall the show was not as good as it could be, main issue was the sound. The sound improved in the end “I Want Out” and “Future World” was quiet decent. 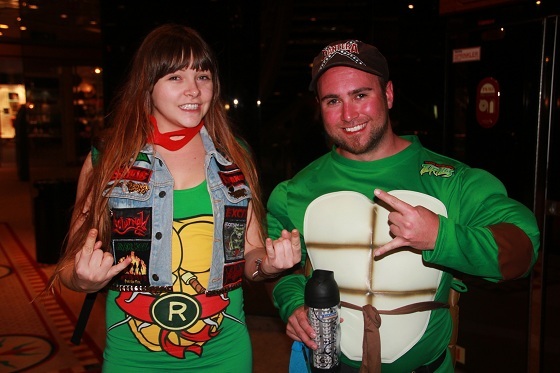 After watching Helloween, we went back to the waterholes for more drinks. 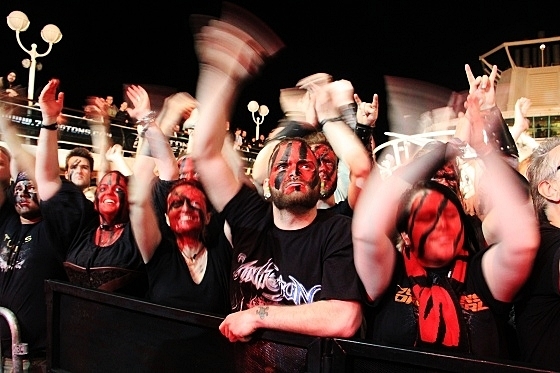 Already at 11.30 pm when Dragonforce were playing, loads of black and red faces were spotted in the crowds. 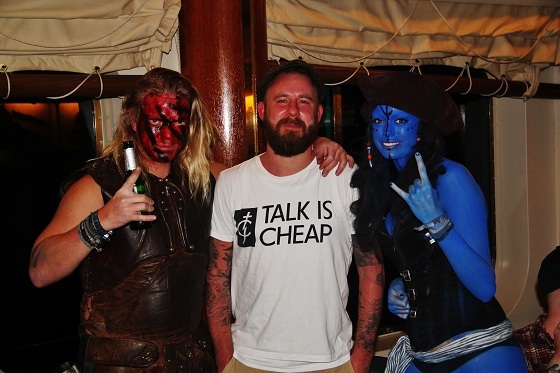 It´s only one band that have those kind of fans and that’s Turisas. Since we are both Turisas fans we went back to the cabin and prepared ourselves to show our warrior faces. One by many appreciated and upcoming events was Metal Church reunion. The first band to hit pooldeck. Fans were the ones who decided Metal Church setlist, mostly songs from their prime time during the 80’s was a new and a great addition to the cruise. “Ton of Bricks” followed by “Start the Fire”. Total ecstasy from both band and audience. After a couple of real classics the “God of Thunder” decided that it was a good idea to open the skies and drench the boat with heavy rain. It didn’t really affect the performance, it was tight, brutal like a well oiled machinery. 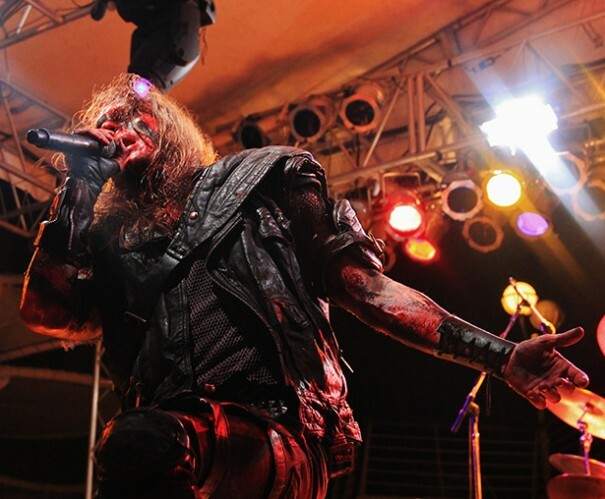 During the wait for the Finnish folk metal band Turisas the North American fan-club painted peoples faces. When the band entered the stage, they were met by the metal elite. People painted ear to ear with blood red and black as night, ready for war. The march of the varangian guard couldn’t make better sense. It felt like the entire guard were present in the public. The sound felt flat sometimes but since it was an all time karaoke going on during the entire show it really didn’t matter. Beer and drinks were flowing, blood and black colors as far the eyes could see, moshing and screaming. A performance well known to be remembered. More known to all “cruisaders”, the day ov hangover. Is the day of meet and greet with all bands. We started with a brunch at the windjammer (top deck restaurant). Sadly missing Arkona on pool-deck. Thing is, there is so much going on all the time that you cant really plan your day accordingly. For example sitting in the restaurant and someone from your favorite band walking by. And suddenly sits next to you, its an experience very few festivals offer, unless you´re backstage. The meet and greet was stretching from 12pm to 12.15 am. 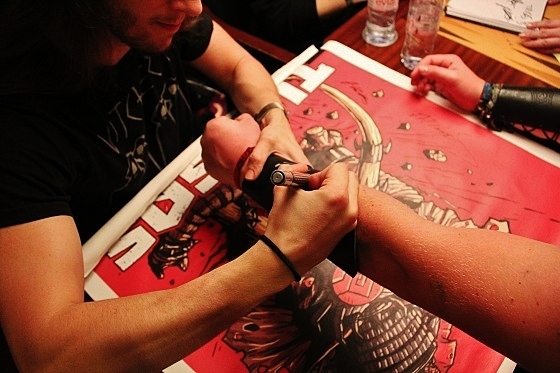 We were lucky to meet all our bands, chatting with them and get things signed. 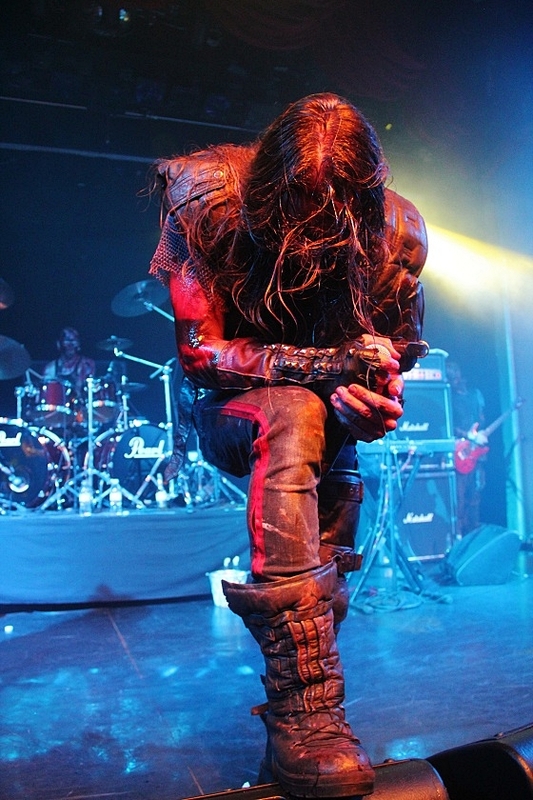 We had a great time talking to Olli Vänskä the violin player in Turisas. Got a few relics signed as well. The cue for many of the bands were long, but almost every fan had their chance in the spotlight with the bands for signing session and talk. The UMC organizers and staff is kind and professional, there was a common understanding from fans to staff at almost all times. Same goes for the personal that working on the boat. We met many from the same staff as we met on the last cruises. 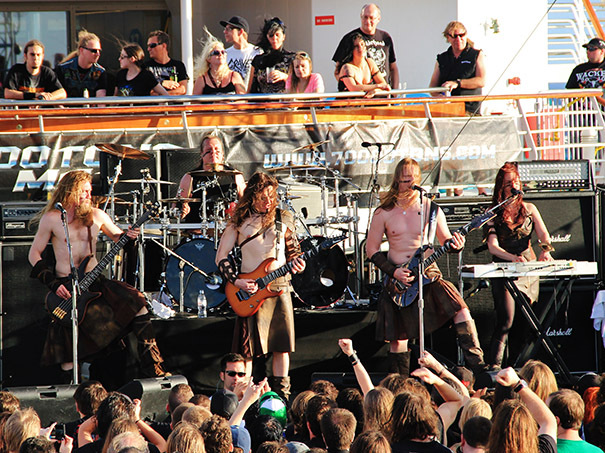 During the meet and greet sessions we manage to to see the Viking/folk metal band Ensiferum from Finland, their second cruise and almost the same time as 2011. The sword bearers started around 4.00 and the deck was crowed with fans with plastic swords, chain mails and various fitting items for a Caribbean cruise. Ensiferum‘s music it´s catchy, fun and likable for almost any metal fan. Dressed in leather kilts with bare torsos as the sun rays burn the Scandinavian skin was a sight. So was their music, I counted at least 9 songs from their different albums. “Twilight Tavern” and “Victory” song was as great as ever. It was also great fun to see Petri Lindroos vocalist of Ensiferum trying to get the audience to hymn Iron with a da-dada-da. Didn’t work out great, but it was fun. Overall it was a really good show and to top the pinnacle for a Viking metalband, was hilarious to hear star wars theme as an outro. 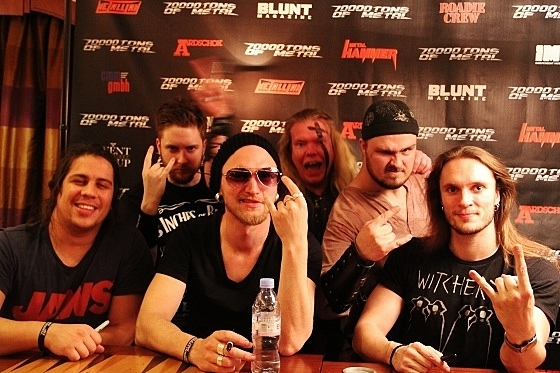 After doing the last meet and greet with Turisas 8pm. We went to get our fellow viking warriors to setup an army of face painted warriors in Majesty’s most fancy restaurant: The moonlight dinner. We marched in like a mighty fellowship all dressed up in proper viking attire. Howling like banshees and screaming as berserkers. Never has the restaurant been so silent of a groups appearance. One other good thing with a metal cruise ship is the blend of luxury and metal. You eat for free, or at least it´s included in the price. Most guys instantly ordered two main dishes and a bucket of beer. We had the honor to have the main man behind the cruise Andy Pillar visit our table and thanked us for our loyalty. A gesture that was really appreciated. After dinner we rushed up to German thrash legends Kreator for their show at pool stage. This year Germany surpassed the American passengers. 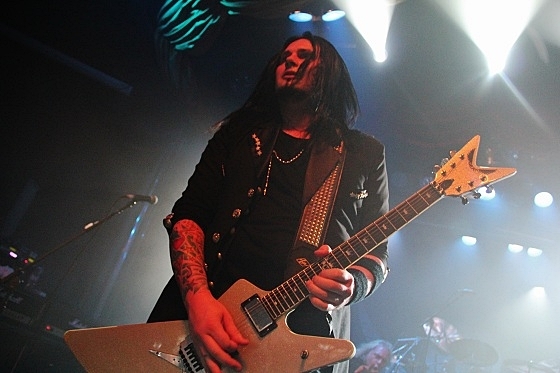 Which was noticed in the audience, Kreator, Doro and Helloween probably contributed to that. Unfortunately heavy winds managed somehow to carry away lots of the overall sound. So we moved forward on the slippery foundation. Right in time for “wall of death”. People felled all over the place in a chaotic manner in the pulse of ultra fast riffs and heavy drums. A solid performance that still states after 20 years of thrash: Kreator play world class thrash metal. 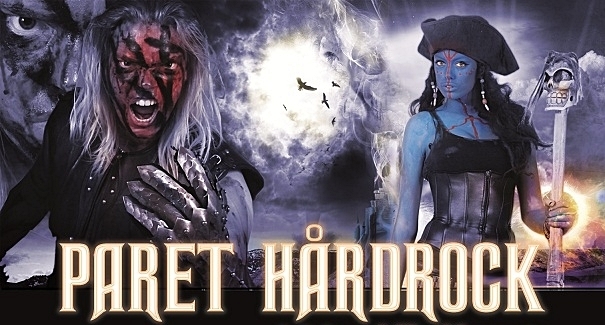 After thrash comes; Gothenburg Sound. In Flames took over were Kreator had left off. First time we managed to see the Swedish metal giants without pyrotechnics at deck 5 the chorus line theatre. The entire theater was filled with enthusiastic fans. Most of their recent material were delivered to perfection in our opinion. “Sounds of a Playground” fading, “Deliver Us” and “Only for the Weak” was plain awesomeness. Since we were far behind we didn’t catch the entire set and went to bed quite early to feel fresh for the upcoming siege on Grand Turks next day. With first light of dawn we arrived at the beautiful island Grand Turk. The ship started to debark hungover passengers early in the morning. The locals had probably no idea what kind of attack that was upon them. A legion of black shirts and pale skin warriors took the beach without any struggle. Within the first hour most of the pop and reggae music were annihilated and swiftly changed to guitars, abysmal growls and blast-beats. We were home yet again. While walking the sandy dunes we got an offer we couldn’t refuse from Snowy Shaw to go snorkeling with the Swedish metal elite: Evergrey and Sabaton which we of course didn’t turn down. Out in the blue we were snorkeling at the great edge of the ocean. On one side, white sand and colorful fish, the other side; the dark ocean. Movies as Finding Nemo at the ocean drop off or Jaws have never been more present in our mind than here. Back at the beach, passengers were served local brewed beer to the tunes of Alestorm. Quickly we noticed the surrealistic panorama view, the contrast of black shirts in the white sand and the turquoise water was one of those sights in life when you really couldn’t ask for more. 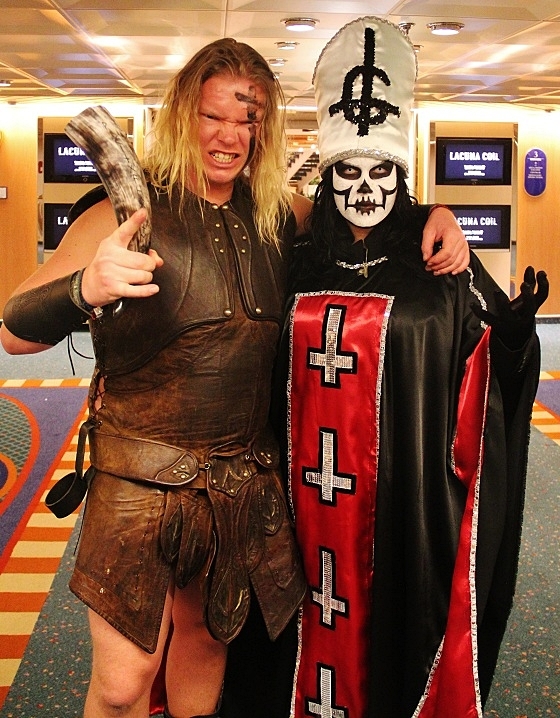 As the sun drowned in dark and the sky turned grey, the black legion made their withdrawal to Majesty of the seas where Turisas yet again were ready to wreck havoc at the Chorus line theatre. Their set was really similar to the first one. Sound was improved, and hunting pirates was brilliant for a cruise like this. To our disappointment “Rasputin” wasn’t played so we decided to create our own disco at schooner bar on the grand piano. We went harder on it than Vika the heavy metal cover pianist did. Beer and bottles were floating on the blank beautiful lacquer finish when another round of flip the cup competition started. During late hours juvenile dresses together with cool creations were present all over the boat, going to Boleros lounge for harmless fun such as karaoke with obligatory alcohol abuse. Drunked as skunks after watching the hilarious chairs of death (wall of death but with chairs) on the Holy Grail show, we stumbled into our cabin just to wake up in the same condition for the last day challenges. We managed with abstinence from alcohol withdrawal get up just in time to see the infamous belly flop contest. Mighty men in various sizes were lined up to face the audience and band members as judges. Rules were simple, create the biggest tsunami in the pool and win glory and champagne. This particular tournament gathers everyone on the boat. The deck is totally overloaded with people. First price for bellyflop went to Canada. At the same time we retreated to the most unfrequented place on the ship: The Spa. After three long nights we decided to be un-metal just for 40 minutes of foot massage. Right in time for the Russian pagan metal band Arkona with Slavic folktales and music. Beautiful front woman Masha do both growls and clean singing. This is a different and rare jewel in the metal world not to be missed. Best songs from their second set: “Goi, Rode, Goi”, “Yarilo”, “Slavsia Rus och Stenka Na Stenku”. During the trip over 10000 bottles of beer were consumed a day. (Not counting cans) Over 25000 pizza slices were eaten during 4 nights and days. During midday Jeff Waters (Annihilator guitarist) Hosted the last of his popular two hour allstar jams. 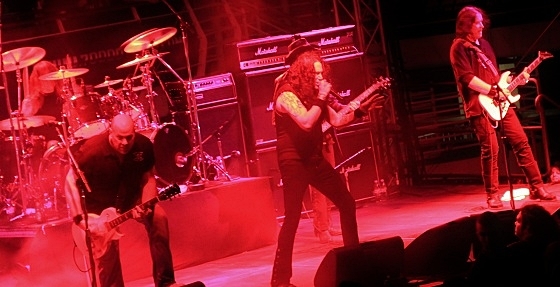 Members from various bands covered famous metal covers. Doro and Cristina Scabbia from Lacuna coil were awesome together. Another sight was Petri Lindroos (Ensiferum) in a Hawaii shirt to cover “Enter Sandman”. Time goes fast when you have a great time. Beer drinking, hell raising in all the bars, suddenly nightfall were upon us. Since we felt that we missed to much of In Flames first show, we decided to see the entire second one. 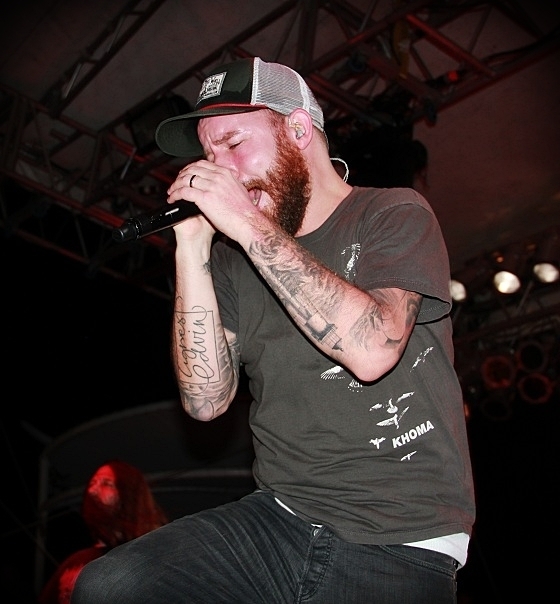 This time vocalist Anders Fridén urged the audience to do a stress test for the security. Everybody Crowd-surf! Girls in split, men in strange costumes and some naked guy also flowed with the stream of hands that carried them to the photo pit. It was hilarious to see. The Security was less impressed though. We stayed in the warm, nightly breeze, cheering for a fantastic cruise with fans and band members alike, waiting to see Sabaton march up to the stage again. This time as promised songs from “Carolous Rex” were in Swedish as it should be sung. After many great songs Andy “The skipper” Pillar went up to the stage to have his first speech of thanks to everyone involved in the cruise. 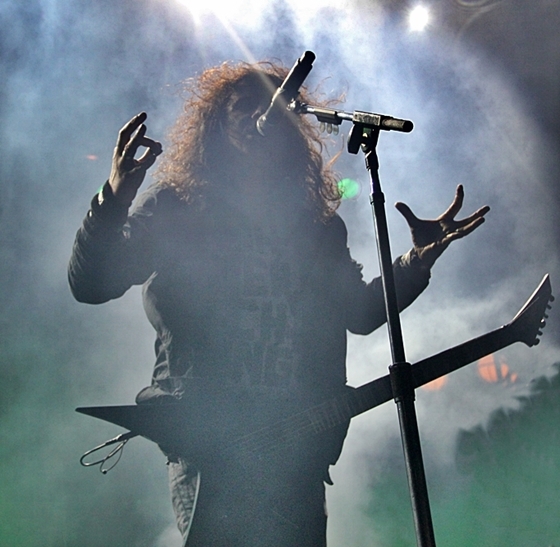 The festival audience worshiped his presence as a deity and a genuine, almost telepathic metal feeling were summoned. 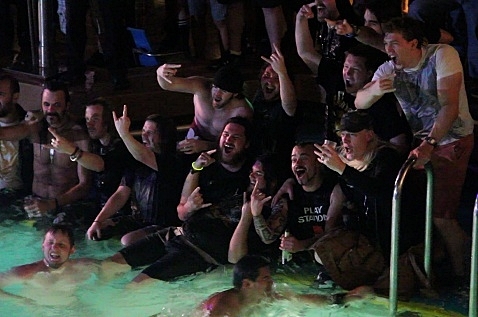 Sabaton completed the cruise with Metal cru(is)e, yet again front man Joakim had problem with his laundry, so a repeat of the well known stage dive-pool dive success from 2011 were at hand. Out in the audience he was carried by fans like a triumphal procession then tossed in the pool. This time followed by the rest of his band, fans, life preservers and other attributes from the ship. A phenomenal ending to this year legendary 70000 tons of metal. 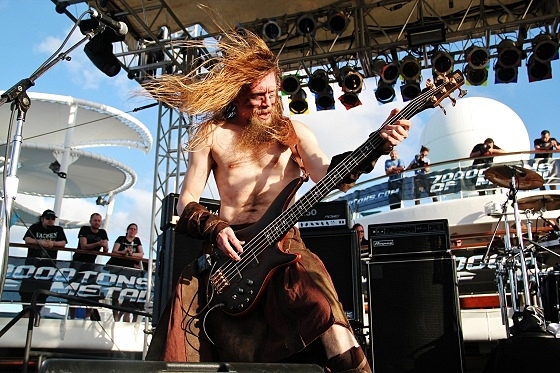 If you want to reach Metal Nirvana for 2014, check out 70000tons.com, booking and bands for next year will be available SOON!